I am working on carving faces and found this easy to follow video. 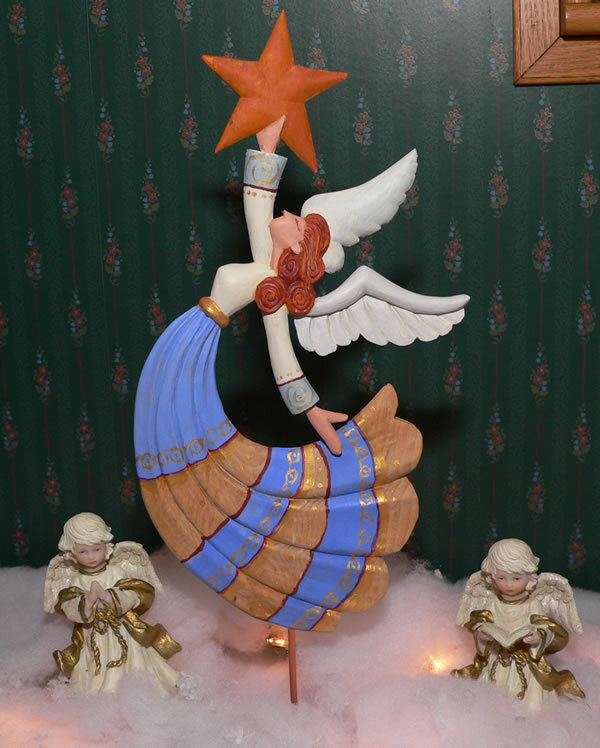 Mary May is an accomplished woodcarver and instructor from Charleston, South Carolina. Mary has produced the following fantastic video, which demonstrates the proper usage of gouges an V-tools. In the video, Mary also identifies the how tools, can cut both, with and against, the wood grain in the same cut. 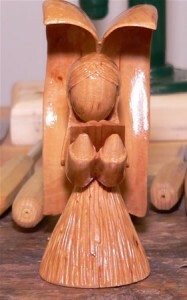 Mary May, is a carver that inspires me to continue developing my carving skills. She openly talks about her woodcarving beginnings and how she has developed her skills over time. Knowing her history and viewing the masterful carvings she produces today, is an encouragement for me to continue developing my skills. I am sure to never reach Mary’s level of carving, but the more I learn and the more enjoyable my hobby becomes. I may even vacation in historical Charleston and contact Mary for an individual carving class. I just finished painting this little guy and now has a home on our Christmas Tree. This carving is out of native Indiana Basswood and is a fun project with more detail than I originally thought. It comes from the pages of WoodCarving Illustrated, the Holiday 2013 issue #65. The project calls to use a woodburner for the fur texture, but I just used a small v-tool, but other than that, I loosely followed Leah Goddard’s guide. 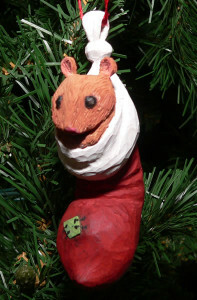 I recommend this project and will carve a few more for gifts at some point. Where do you get carving wood? My answer anywhere I can! I have found blocks of wood on vacation, business travel, asking friends to bring back chunks of wood from mission trips, and even from my own backyard when a small Maple tree was damaged. The majority of my stock came to me about about 15 years ago. A retired gentleman owning a hobby saw mill made me a great deal on a pickup truck load of Southern Indiana Basswood. You can carve alot of chips from a pickup load and I am still working on it. Pictured to the left is a “Herby’s Angel” that I carved from the some of this Basswood stock. Unfortunately, Indiana basswood is not high quality wood as it often has defects and hard to carve grain patterns. If you look close at the picture, you can see some of the defects. The best carving stock seems to come from Minnesota and Wisconsin areas. This wood is typically straight grained and clean of defect. I have at times purchase blocks of Butternut, which is my favorite wood to carve as I love the smell and the beautiful grain. I have not located a local source for butternut, which drives the expense up when paying for custom sawing and shipping charges. Where you find your carving wood? What is the best deal you have run across in finding carving stock? What is your favorite wood to carve? Thank you for visiting and I look forward to your comments. Deepwoods Ventures handmade forged carving knifes. The most affordable carving tool is one that will be around for years! I work in a profession where burnout is a huge problem. I am an IT professional where there is always a hot project or a customer need, or something. It is never ending and sometimes it is impossible to take 30 minutes of uninterrupted to have lunch. I just read and article by Brein Posey posted on TechRepublic that talks about the 10 things IT folk need to do to avoid burnout.